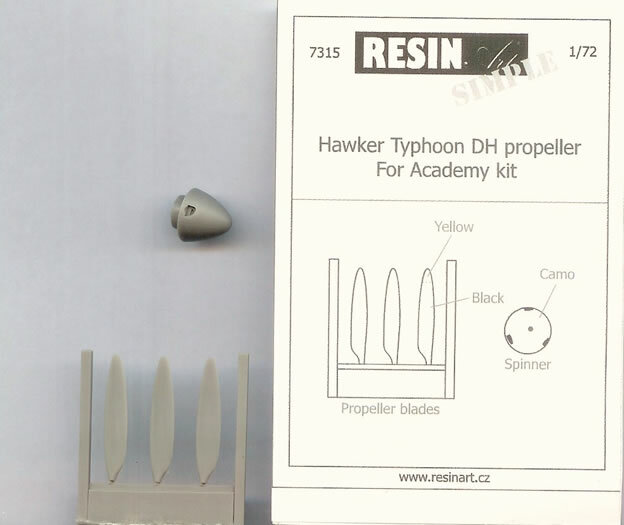 7312 - Hawker Typhoon: Main wheels, radiator matrix & pitot. Available on-line from Hannants for £5.45 and Modelimex for €5.21. 7315 - Hawker Typhoon: 3-Blade propeller & spinner. Available on-line from Hannants for £5.47 and Modelimex for €4.38. 7316 - Hawker Typhoon: 4-Blade propeller & spinner. Available on-line from Hannants for £5.47 and Modelimex for €4.38. 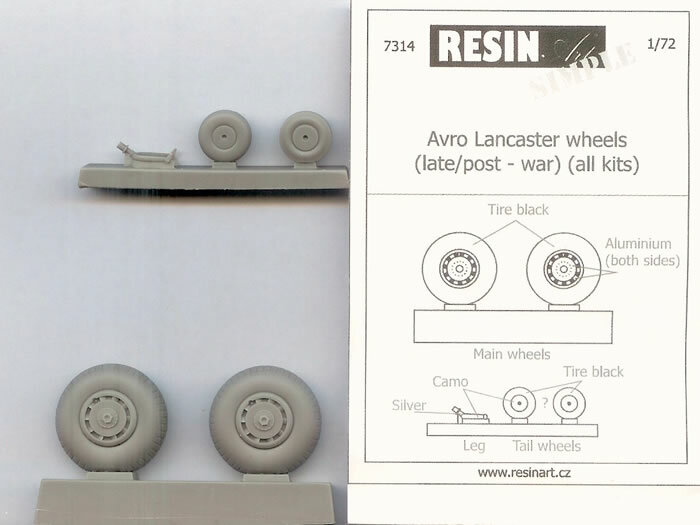 7314 - Avro Lancaster: Main wheels & two tail wheels & leg. Available on-line from Hannants for £6.47 and Modelimex for €6.25. 7313 - Henschel Hs 129B: Main wheels, long and short exhaust pipes & tips of cannon barrels. Available on-line from Hannants for £5.45 and Modelimex for €5.21. 7311 - Supermarine Spitfire MK XIV: 5-Blade propeller & spinner, plus exhaust pipes. Available on-line from Hannants for £5.95 and Modelimex for €5.21. 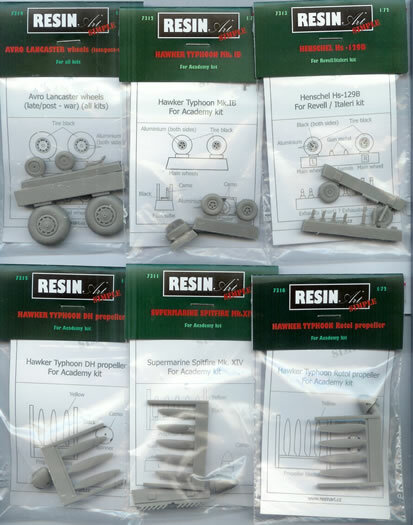 Resin, a few parts to each set. Very nicely detailed and cast to the highest standards. Excellent compliments to models of the aircraft types intended, and not necessarily restricted to the kit brands listed on the packaging. Highly recommended. Resin Art is a relatively new brand of resin detail sets from the Czech Republic. They produce detail sets in several of the popular scales. These sets have “Simple” printed at an oblique angle below the Resin Art logo, no doubt to indicate that these are indeed simple detail sets, as opposed to the more involved detail sets Resin Art also produces. All of the sets come in a plastic bag with header and simple instructions concerning painting. The fitment of parts is obvious, and so no instructions are provided. 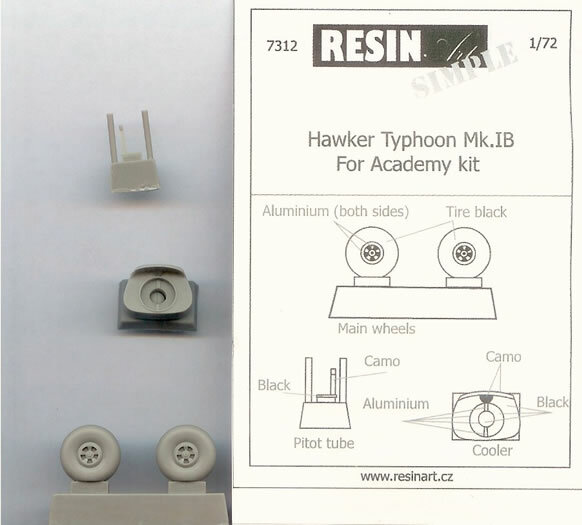 The three Typhoon sets are intended for the Academy kit, and offer a level of refinement not achievable with injected styrene in this scale. The Lancaster Wheels are intended for all brands of kit and would improve any of them. However they come most to the rescue of the Revell kit. A choice of normal or anti-shimmy tail wheels is provided along with the tail wheel leg/yoke. 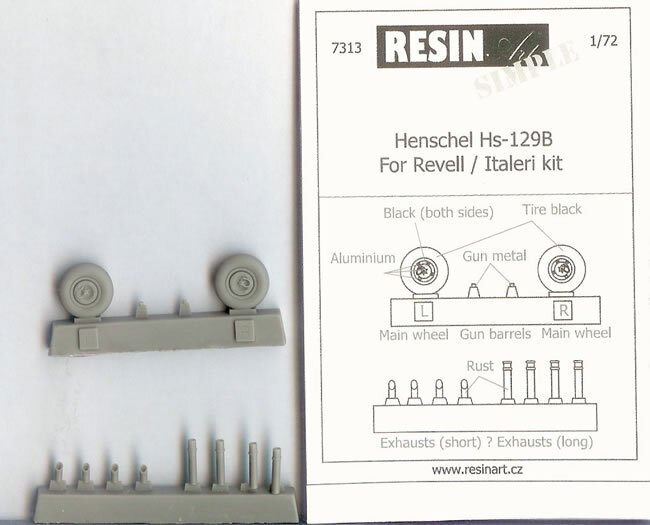 The Hs-129B set is intended for the Italeri/Revell kit, although Bilek and Tamiya have boxed the same kit. A choice of short and long exhaust pipes really does address some rather indifferently detailed parts of the kit. The wheels are nicely done, and two tiny cannon barrel tips are provided as well. 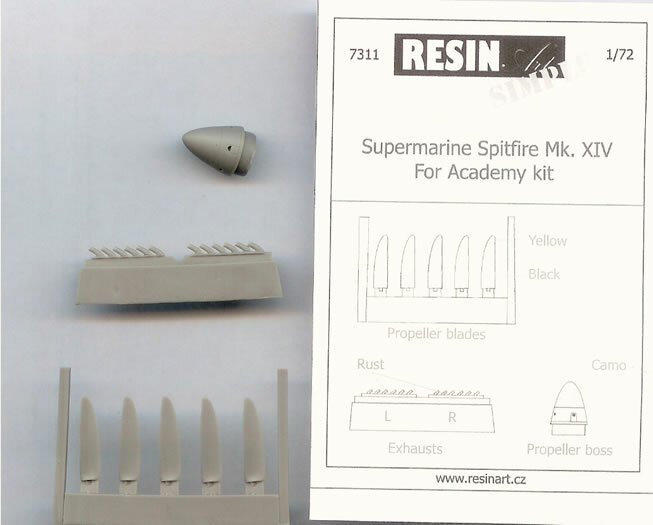 The Spitfire MK XIV propeller and exhaust set is intended for the Academy kit, but could no doubt enhance a number of other brand Griffon engined Spitfires (Airfix, Fujimi, Ventura, Xtrakit, MPM etc). 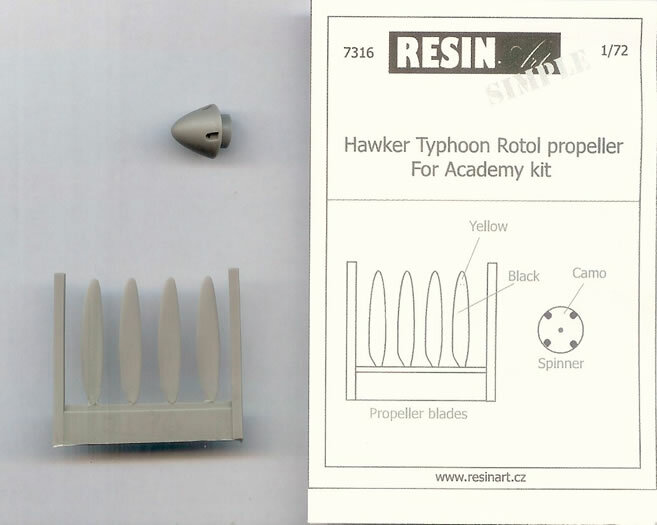 Of course there may be a little variation in spinner base-plate diameter amongst these other kits, but at least the blades could be used. These are very well produced sets that should refine and bring to life your models of the subjects they are intended for.